Make plans for the protection of plant and equipment. Develop a staffing policy that identifies essential employees and which of them, if any, must remain at the facility during the hurricane. The policy should identify when employees will be released from work as well as when they are expected to return. Businesses may predetermine that employees will return to work when employees are ordered to return, in case telephone service is out. Identify and protect vital records such as accounts receivable, customer records, tax records, and other personnel and administrative documents. Review insurance policies to ensure that there is adequate coverage. Is the facility in a high hazard, evacuation area? Does the insurance package include wind/storm coverage? Is the facility located in a flood prone area and is the flood insurance adequate? Does insurance cover damage to contents, including vital records and office equipment? Does the package include liability coverage for injury to employees as well as potential lawsuits from customers? Compile an Emergency Contact List with 24-hour telephone contact numbers of essential employees. Identify vital records and make back-up copies/and or transfer them to microfilm. Identify a safe storage level area within the facility where records can be relocated, if necessary. This area should be above ground level and away from windows and exterior walls, which may leak. In a one-story facility, file cabinets and boxes may be placed on pallets up off the floor. Consider moving vital records off-site, particularly if the business is in a storm-surge vulnerable area. Check security and flood lighting. Identify lightweight, loose items in outside storage areas that may be blown around in the wind. Identify emergency power requirements and determine if generator is available. If facility must be operational during a hurricane and a generator is not available, rent or purchase a generator. Test generator monthly during the hurricane season. Determine if computer support will be available for primary/ critical computer users who need to remain operational during a hurricane. Verify that communications equipment is operational. A battery-operated radio or TV (test reception in building). One flashlight per person working during the hurricane. Extra batteries for both radio and flashlights. Emergency tool kit, if necessary. Food and water supplies for staff assigned to the facility during the hurricane. Be sure to include needed utensils. 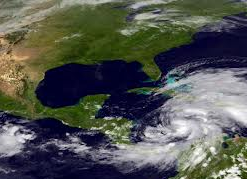 Provide employees with hurricane preparedness information. Secure all doors, windows, and other openings against wind and water. Tie down or bring indoors any objects which may be blown about by hurricane winds. Installhurricane shutters, cover windows with boards, or close drapes. If a room must be occupied during the hurricane and window protection is not available, windows may be crisscrossed with tape to slightly reduce flying glass. Verify that vital records are in a safe storage area. Files, records, and storage cabinets may be wrapped in plastic for moisture protection. If necessary, temporarily relocate records to a safe storage facility off-site. Confirm availability of necessary computer support. Inventory hurricane emergency supplies and restock if necessary. Dismiss essential employees temporarily so they can secure their personal property before returning to duty. Move desks, files, equipment and furniture away from un-shuttered windows. Papers, drawings, etc. should be placed inside files or desks. Wrap office equipment, such as copy machine and computers, in plastic to protect against water damage. Turn off all air conditioners, disconnect electrical equipment, turn off lights. Assess basic damages at work site including roof, water, damage and broken windows. Do not turn on computer equipment if there are indications of low voltage power fluctuations, low air conditioning output, water under raised floor, broken windows or damaged equipment.